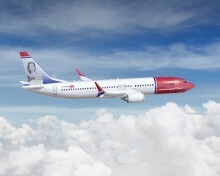 Norwegian, the World’s Best Low-Cost Long-Haul Airline and Europe’s Best Low-Cost Airline, today announced it will launch flights from both Denver International Airport and Seattle-Tacoma International Airport to London’s Gatwick Airport this September. With these additions, Norwegian now offers nine nonstop routes from across the United States to London, more than any American airline. 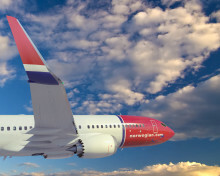 Norwegian announces that tickets for its Boeing 737-MAX transatlantic service are now on sale at an introductory fare of $65 one-way including taxes. The airline will launch 10 new routes from Stewart International Airport, T.F. Green Airport in Providence, RI, and Bradley International Airport in Hartford, CT, to Ireland, Northern Ireland and the Scotland this summer. Norwegian and its charitable partner UNICEF announce the third “Fill a Plane” campaign, an altruistic initiative to bring humanitarian aid and developmental materials to children in developing nations. The 2017 humanitarian flight, which takes off for Bamako, Mali on Monday, March 6, will bring much needed supplies to Malian children. Global expansion driven by new routes, high load factors and continued fleet renewal, contributed to Norwegian’s best ever annual result, with a net profit of $136 million (1,135 million Norwegian kroner). The load factor was 88 percent. Today, Norwegian was named one of Fast Company’s 10 Most Innovative Companies in Travel for 2017. The magazine’s annual ranking of the world’s Most Innovative Companies honors leading enterprises and rising newcomers that exemplify the best in nimble business and impactful innovation. Norwegian was the only airline featured on this year’s travel list. Norwegian’s partnership with UNICEF has helped many children in need in 2016. 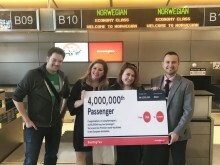 With a simple click during their booking process, Norwegian’s passengers have donated more than $600,000/5 million Norwegian kroner to support UNICEFs work for children. Norwegian reported its highest ever passenger figures in a single year with almost 30 million passengers and a load factor of 88 per cent in 2016. The launch of 34 new routes and a substantial increase of intercontinental traffic contributed considerably to the growth. 300,000 American passengers are now Norwegian Reward members. Norwegian and its agency partner, McKinney, launch The Best Free Shipping Sale on Earth and send holiday shoppers on an adventure in the process. Norwegian sends consumers across the ocean to pick up their holiday items for free instead of waiting at home for delivery. 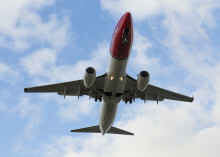 Norwegian announces increased frequencies on five routes from the United States to London Gatwick. Daily service from LAX and double-daily service from JFK to be offered in 2017. Norwegian announces it will open two additional pilot and cabin crew bases in the United States next year. 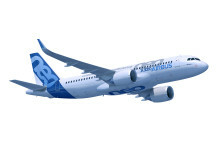 The decision follows yesterday’s final approval of a foreign carrier permit for Norwegian Air International (NAI) by the US Department of Transportation (DOT).